1. Stop Multitasking — Used for decades to describe the parallel processing abilities of computers, multitasking is now shorthand for the human attempt to do simultaneously as many things as possible, as quickly as possible. Ultimately, multitasking may actually slow you down, make you prone to errors as well as make you forgetful. Research shows you actually need about eight seconds to commit a piece of information to your memory, so if you're talking on your phone and carrying in groceries when you put down your car keys, you're unlikely to remember where you left them. Any time you learn a new piece of information, you’re more likely to mentally record that information if it’s repeated. Repetition reinforces the connections we create between neurons. Repeat what you hear out loud. Try using it in a sentence. Write it down and read it aloud. But the work doesn’t stop there. Research shows that simple repetition is an ineffective learning tool if used on its own. You’ll need to sit back down later and actively try to retrieve the information without looking at where you wrote it down. Testing yourself to retrieve the information is better than repeated studying. Practicing retrieval creates more long-term and meaningful learning experiences. The human brain is the most complex entity in the known universe. So treat your brain like the powerful machine it is and give it the highest quality fuel. Eating the right foods — and avoiding the wrong ones — should be a cornerstone of any long-term strategy for keeping your brain fit for life. The Mediterranean diet is widely considered the healthiest diet on the planet. People who eat this way rank high in health and longevity, and have some of the lowest rates of Alzheimer’s disease. It’s been shown to boost memory and attention and slow the rate of age-related cognitive decline. 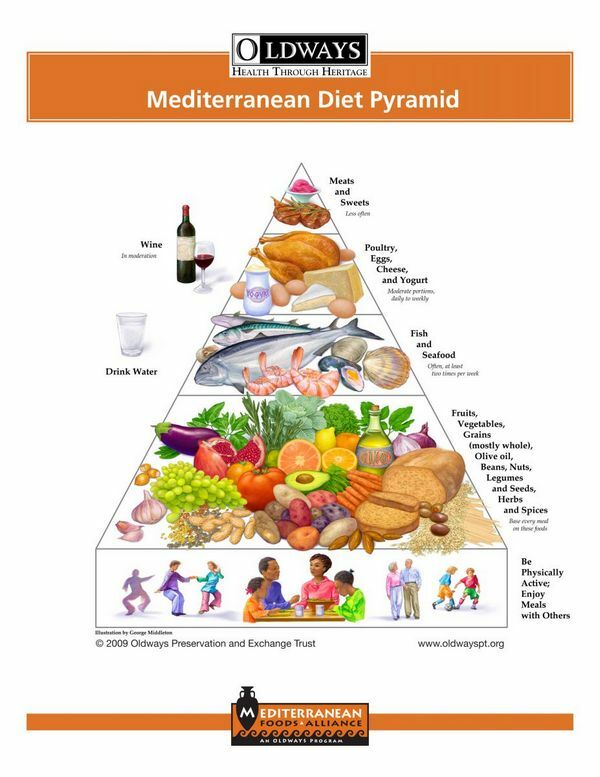 Here’s a visual of the Mediterranean diet. 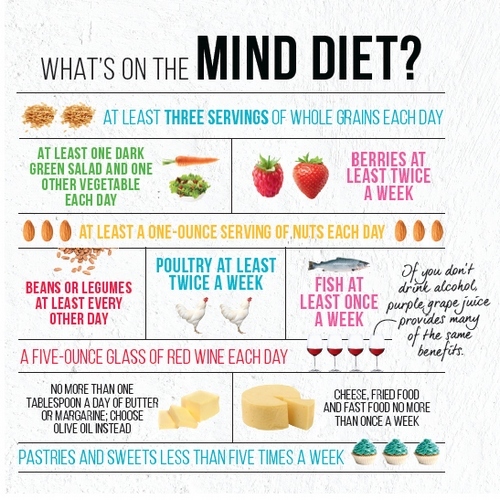 The MIND diet was created specifically to preserve your mental faculties as you age. MIND is an acronym for the Mediterranean-DASH Intervention for Neurodegenerative Delay. In the MIND diet study, over 1,000 seniors were tracked for 8 years. When study participants rigorously followed the MIND diet, they reduced their risk for Alzheimer’s by an impressive 53%. Researchers were surprised that participants who didn’t follow the diet strictly still experienced substantial protective benefits. Even making modest dietary changes reduced their risk by 35%. 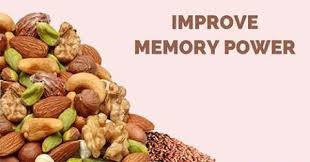 Interestingly, a very low carb or ketogenic diet (high in good fats and proteins) also shows promise for memory improvement. But don’t let these seemingly contradictory diet concepts confuse or discourage you. The thing to focus on is what all of these diets have in common, not their differences. They emphasize eating “real” rather than processed foods, avoiding sugar and trans fats, and including healthy fats. Grouping or chunking refers to the process of dividing newly learned information into chunks to produce fewer, larger chunks of information. For example, you may have noticed that it’s much easier to remember a phone number if the 10 digits are grouped into three separate chunks (e.g. 555-637-8299) rather than one long number (5556378299). Modern technology has its place, but unfortunately has made us “mentally lazy.” Before you reach for your phone to ask Siri or Google, make a solid attempt to retrieve the information with your mind. This process helps reinforce the neural pathways in your brain. Sugar and fat have been linked to impaired memory. A recent study in humans found that a diet high in fats and sugars — common in a Western diet — impairs hippocampal memory. However, the study relied on questionnaires and surveys, which may not be as accurate. 8. Get Organized - If your house is in a mess, you're more likely to forget things. Jot down tasks, declutter your home and note down appointments. Set aside a particular place at home to keep your keys, and limit distractions. Live by to-do lists, keep them up to date and check off the items you've completed. Physically writing down new information actually helps reinforce it.